If you open 3 new accounts to buy points, expect pooling to fail and with fraud flags raised on the accounts. Should be fine with established accounts that have recent stays. Does having the 5th night free makes much of a difference? If you are someone who happily spends £1872 on a hotel for 5 nights, then £2340 (to buy 600000 points for 5 nights) for what is nominally priced over £10000 is still pretty good, and works out to 1.7p per point (5x Rob’s valuation). Someone mentioned the Hilton Garden Inn Vienna South a few days ago. With 600000 points you could stay there for 2 months. When I stayed over Christmas at 10K points, the paid rate was around €170, so I nominally got 1.5p per point. Good point re Amex Plat. Yes 5th night free matters as a wasted opportunity costs us money/points against value for points principles exception being no choice. OT but Hilton related: has anyone else had those mystery platinum visa 5000 bonus points for recent stays removed? Just noticed as I was making a booking that the points awarded on a 2nd Feb stay have been removed. Yes. Now gone negative for my account due to my earn and burn philosophy..
Hi Rob, nice to see my articles mentioned. One of your HFP readers has just arrived at the Conrad Rangali, so I’ll be asking him his thoughts on how he found the resort later this week. How well have you researched the costs for the Speedboat transfers? I bought points in the recent 100% bonus sale, and I’ve been amassing Amex MR points to punt to HH, but 120k seems a tad rich, I’ll await reviews of the quality of snorkelling on the coral reef at the WA before deciding if it’s for me. Aa a comparison approx £6k gets you 10nights full board at Vilamendhoo inc UK economy flights + seaplane transfers, that’s a decent resort I’d recommend folks looking at if they don’t have points. FYI seaplane transfers out here are now $590pp. Enjoy your stay, be sure to ask for an invite to the managers drinks reception and careful in the sun, it’s pretty strong out there. Thanks for the tips! Our invite for manager’s drinks tomorrow just came through, and we’ll book in that photoshoot – sounds like a good deal! I view the seaplane as part of the holiday. To me the flight is a fantastic experience and after a long haul journey there the lounge with views over the … what is the water equivalent of the apron and runway?… is joyess. Boat was free when we went to the One & Only, admittedly 10 years ago. Boat transfers are no longer free at O&O RR – expect to pay around $600 round trip per adult and $300 per child. Over on FT there has been discussion for a while on this topic. Yaght transfers from Male appear to be $386 per person but still to be confirmed exactly if this was roundtrip or each, each way. If the latter, that’s expensive as also mentioned the resort taxes on top of that at 23%. You would need a min of 7 x days there to get the full experience. No taxes or fees on points redemption? Cash bookings shows a nominal ($6?) tourism levy which I imagine is due. Over on FT, posters are stating the transfer to this resort is $370pp each way. Ouch. Cheaper to fly to the Conrad then. That’s crazy. One & Only was free when we went. That’s outrageous, you must be able to find some dude with a boat who’ll don’t for less than that. It’s only about 20km…. Get your snorkel on! On the other end of the scale I finally got round to staying in the Hilton Leeds at the weekend. Upgraded to King Corner Suite (only HH Gold, but I asked nicely if they had availability). Good size, & condition, although maybe due a refurb in a few years. On-site Parking on floors 1-2 is £15, handy it’s in the same building, but pretty tight to manoeuvre round even in a small SUV. Overall a decent stay, it was 20mins walk from the First Direct concert arena, didn’t need a taxi although reception kindly offered to book for us. With current bonus, it earnt almost 5k points for a £100 booking. Would use again if I happened to be in Leeds, although IHG have also just taken over the Met. I stayed at Hilton Leeds in late 2017. What a dump, even in the suite. They still owe me a free night in a suite but doubt I’ll take them up on it. But agreed on breakfast, v good kippers. I stayed in Hilton Leeds in probably 1996, very early in my career, and it was a dump then! I was offered a free upgrade to a suite after leaving a bad review a couple of years ago for the Hilton Leeds. I never took them up on the offer. The brand new Doubletree just around the corner is infinitely nicer and almost always cheaper as well. The Tower Hill DoubleTree is now my parent’s favourite choice when they’re in town, and it’s much cheaper on Saturday nights. Rooms (and beds) probably still beat the Hilton Park Lane (haven’t stayed there in ages though). I stayed 2 years ago and it was pretty good, in terms of Hilton which i stay at regularly. Interestingly, it’s the only hotel other than Syon Park that has proper free weights, not just dumbells! There’s a whole set of articles around exercise that could be explored – good for running / weight training etc. I lived in Leeds for many years. The Hilton has the styling and ambiance of a multi-storey car park (and sometimes the vague aroma of piss too). There are many other better options at all price ranges and loyalty schemes close to the arena and yes the Doubletree is newer and better too.If you want a mid-range predictable but uninspiring property on points, the Marriott is nicer and better located than the Hilton. For cash and a functional basic room to see a show, the large and new Premier Inn directly opposite the arena will serve most peoples’ needs. With the 5th night free, do you need status when you book or also when you stay? Are you sure they don’t check? They had an up to date register of all clients on status as I was silver when I booked and diamond when I arrived at Rangali. I was greeted by name and as being a Diamond member was mentioned numerous times by the host to us. I wouldn’t chance it, pick up Gold through Plat or fast track, status match.
? once it is booked it’s booked. There is good reason to keep status but to answer the OPs question, you just need it when booking. If you don’t have status when you stay you will be paying through the nose for breakfasts. It will probably be more expensive than Rangali. Best to have good when you stay aswell. Just to confirm, on your quote was the Yacht transfer Definetly $340 per person roundtrip or each way so all in to two people $680 or $1360? Was there also any mention of taxes of 23% on top of that charge? I hit the £10,000 spend on my HH credit card in December but haven’t been upgraded to Gold yet. Barcleys tell me to contact Hilton and Hilton tell me to contact Barclays. Anyone have any ideas on how best to resolve this? Complain to barclays and escalate to financial ombudsman. I had a similar issue. Was already Gold but wanted to make sure I had hit the spend for the following year. There is no flagging up when you hit the spend, apparently they don’t have the capabilities to do this, you just need to add it up for yourself. After a number of emails they finally confirmed that yes, I had hit the spend (and then some!) and was Gold for the remainder of the year (was around September 2018) and all of 2019. Would be nice if they had a similar system to Amex and let you know when you hit the target. If Amex can do it surely it’s possible for everyone? OT heading to Hilton La Romana for xmas/new year 2019/20 as it’s all-inclusive I’m guessing Gold doesn’t count for much? anyone had any experience with this? I had to chase them up to get silver when I first got the HH visa, Hilton amended my account after I contacted them via the website. I’m now gold via Amex but that appeared automatically. It’s only a saving when you already committed to pay the full fare. Otherwise, you’re stupid to pay 10k when you can manage to pay only 1,5k. As an alternative to pooling, can you ask someone to “gift” you the miles instead? I assume there is no limit on how many miles a member can be gifted and there is a bonus on gifting right now. Just booked for first week in Feb 2020. Will keep an eye on boat costs though and the potential resort tax. Do guest certificates work there I’m guessing not? Read yesterday someone used two free night certs there on a booking. Still a bit of work to do!! Rob, you have trained us that points are only worth what we would actually pay for flights and hotel redemptions. How much would people actually be prepared to pay in cash for this hotel? Think you’d struggle to find a place in the Maldives for £100 per night. It’s possible. I stayed in 3* resort with breakfast and dinner included, 1 person £108 per night. Boat transfer was a bit rip off at $190 return. I chose the place based on underwater reviews and coral reef. That was most important thing to me in Maldives, not the luxuries which I can have anywhere. Accommodation was dated and not very attractive to the eye, but everything worked, was comfortable, food was ok and beach was very nice. I enjoyed my stayed and wouldn’t hesitate to go back for snorkeling. I agree, the most important aspect for me is the snorkelling and diving, but recent reports of bleaching have deterred me from a return in the last few years. The more southern attols such as Huvadhu may have fared better than others. So £54 per person per night DBB or £216 per room DBB? Or a single room of £108 DBB? And yep specific price per couple/board would be good. Diving/ Snorkeling my top priority too. Biyadhoo Island Resort, I was alone and paid £108 per night with half board. However resort was sure there’s two of us coming and were very surprised to see only me. I guess they counted on 2 x $190 for boat transfer which is pure profit for them. I booked via Hotels.com. Prices will probably depend on time of the year, I was in November and booked in August. As stated earlier, I chose it based on coral reef reviews. Judge that’s why I quoted Vilamendhoo as a comparison for a cash stay, ok not a Conrad/WA but a very good resort. Having stayed twice at the Conrad Rangali, I can honestly say that if I didn’t have access to points I would also cough up ££ to go back to Vilamendhoo. Clearly enough to fill it. I was with a reader the other day who did 10 days over Christmas at a similar resort AND used double Avios (1.2 million) to force open 4 Club World redemption seats! A disproportionately large % of the parents at my kids school spend Christmas in the Maldives, in the same way that a large % of the families head to the same 2-3 Dubai resorts in October (and tend to be on the same flights). Nothing to do with boredom. It’s about going somewhere tried and tested. If you and up at a resort that is good and caters for everything you need and (most importantly) the children are happy!! then it is no issue to return to the same place. When you have kids (making no assumptions as to your situation marcw) then your whole outlook on holidays change. You cant do a ex-eu with 4 stops before arriving to your destination anymore and forcing a double Avios booking becomes a lifesaver). Let me point you towards Maslow’s Hierarchy of Needs. This takes me back. As a published author on Maslow I’m open to consider Christmas in the Maldives as contributing to someone’s self actualization. I’m intrigued too how flying to the same resort as the rest of your existing social circle helps you to self-actualise. It does seem like a modern version of the old factory-fortnight or stop-fortnight in northern industrial towns – where the factories would close for 2 weeks in summer and the workforce would often all go on the same value package holiday together to the same resort (keenly priced due to the obvious economies of scale for travel companies in chartering transport). This seems just the same with fewer pies and pints and more quinoa and botox…. A rather hilarious description given you’re trying to convince people it’s not boring! As a kid we always went to different places on holiday (generally campsites!) – but then that might be different to Robs circle as we were neither rich nor spoilt? If we dared to “not accept anything other than a fancy kids club in Dubai” then I imagine we wouldn’t have been going on holiday at all! I know what you mean…. I generally dont like going to the same place as I believe theres so much more to see in the world. BUT since our trip to Dubai thats all the kids are asking for. And even if/when we go back I doubt they will accept anything else than what we had. We stayed at Madinant Jumeirah Dar Al Masyaf and they rave about kids club and its facilities/service. Kids outlook is totally different. Seems a bit pricey on points for my liking, although even the “standard” room gets you a private pool. I can’t see the cash prices staying this high vs for very long. 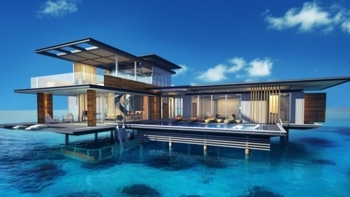 My guess is that its just too high vs established hotels in the Maldives? OT: do supplementary card holders need to do anything when the main cardholder is closing their a/c? in terms of MR points they technically belong to the card holder right? Yes, and the main cardholder needs to empty their MR account before it is closed. Nothing for the supp to do, card will be automatically cancelled. OT: Where would people recommend for a nice romantic break that has sun, sea and sand but doesn’t break the bank? I want somewhere really memorable and outstanding. Not sure I can afford £10K. I have stayed in Rob’s favourite Madinant (booked 2 rooms) and we absolutely loved it. I now want to plan for our 10 year wedding anniversary. Fuerteventura/Lanzarote. Or what about Morocco? What about south Florida, the Gulf Coast and/or the Keys? We’ve done Mauritius, Maldives, Dubai and Florida Keys in the past few years and the standout for us was the Keys. It’s beautiful, relaxed and never stuffy or pretentious. Great beaches and snorkelling too! Key West is rough! it’s where Americans go to drink. I don’t think JP was talking about Key West specifically, more the entire Florida Keys. My last two breaks have been Thailand and the Florida Gulf Coast and loved both for different reasons. The Far East gives more bang for your buck. Did a few day trips to the Gulf/Nature coast of FL in December. Gorgeous beaches, it’s far quieter in away from Festive holiday season though..
Would be interested in going back to Serendipity @ Koh Lipe in Thailand…. Just came back from Koh Samui, stayed at Silavadee for 3 nights and AVANI+ for 2 nights. Can recommend both, probably leaning on first one. Properties are built into the cliff. We stayed at Fanari Villas in the honeymoon suite and we still rate it the best place we’ve stayed. Lots of amazing places to stay though. Depends on your budget. My other half and I went to Punta Cana and stayed at the Now Onyx. At around £2,500 booked through BA Holidays including economy flights I believe this was good value for 7 nights. We stayed in the “Preferred” adults-only section junior suite with private pool. The Master Suites have sea view but are very far back in shore and more expensive. The Seychelles in an Airbnb or Hotels.com property, either Praslin or La Digue gets my vote a million times over!